Event Recognized $1 Million Donation by Panza, Maurer & Maynard, P.A. Getting ready to cut the ribbon at the Panza Maurer Law Library dedication are (from l. to r.): Martin Press, J.D., NSU trustee and member of the NSU Law Board of Governors; Chancellor Ray Ferrero, Jr. J.D. ; NSU President Dr. George L. Hanbury; Susan Horovitz Maurer, J.D. ; Thomas F. Panza, J.D. ; Jon Garon, J.D., dean of the Shepard Broad College of Law; and Dr. Abraham S. Fischler, President Emeritus of NSU. 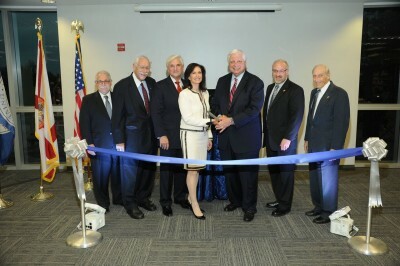 FORT LAUDERDALE-DAVIE, Fla. – After decades of experience providing counsel to Nova Southeastern University (NSU), South Florida attorneys Thomas F. Panza, J.D., and Susan Horovitz Maurer, J.D., have made an even more lasting mark on the university through a $1 million donation, creating an endowed scholarship fund for Shepard Broad College of Law students. In honor of their support, the college named the Panza Maurer Law Library at a dedication ceremony and ribbon cutting at the library on Monday, October 26. Thomas (Tom) Panza founded Panza, Maurer & Maynard, P.A., in Fort Lauderdale in 1976. He has served as NSU’s outside general counsel since that time and as special assistant to five of the university’s six presidents, including current President Dr. George Hanbury. “This generous gift will enable young men and women to attend the Shepard Broad College of Law and, thereby, help create the next generation of well-trained lawyers who can follow in Tom and Susan’s footsteps,” said Jon Garon, J.D., dean of the college of law. In addition to their legal work at NSU, both donors are NSU alumni. Panza earned a M.S. in Criminal Justice from the H. Wayne Huizenga College of Business and Entrepreneurship after receiving his J.D. from Stetson University. Maurer earned her J.D. from the Shepard Broad College of Law in 1980. While she has been managing partner since 1984, Maurer originally came to the firm as a law clerk in the field of labor law. Today, in addition to the their work for NSU, Fort Lauderdale based Panza, Maurer & Maynard is one of the most successful government regulatory and administrative law firms in the Florida. Contributors and board members of many charitable and nonprofit organizations, both Panza and Maurer feel a kinship in giving to NSU. “The DNA of NSU is in my blood. We are NSU,” said Panza, who worked with the Southeastern College of Osteopathic Medicine before it merged with Nova University in 1994 and helped NSU evolve to its current status. The dedication event featured remarks by President Hanbury, Dean Garon, Panza, Maurer and Kerry Valdez, editor-in-chief, Nova Law Review.